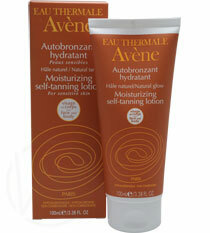 Moisturizing self-tanner specifically adopted for sensitive skin. Face and body. In just one hour, with no sun, this new self-tanning lotion produces an even, natural-looking golden glow that suits all skin tones. Containing a high percentage of soothing, softening Avene thermal spring water, it is well tolerated by even the most sensitive skin. Its lightweight, non-greasy texture is designed for fast, easy application with no staining and no tidemarks. It leaves the skin moisturized and pleasantly scented. The depth and duration of the color obtained depends on the amount of product used and the frequency of application. To obtain an even, long-lasting tanned effect, apply once a day.